Your teeth are a direct reflection of your whole body wellness. If you have a healthy diet , then your teeth and gums will be healthy as a result. 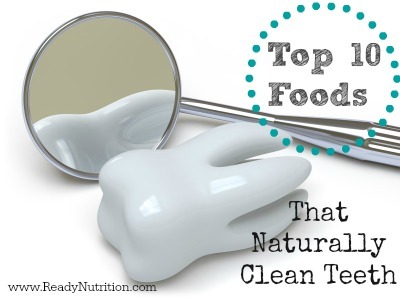 As we continue exploring natural alternatives to cleaning teeth , we must mention these top ten beneficial foods for the teeth. Fruits – Some of our favorite fruits and vegetables are natural abrasives and eating them scrubs your teeth in a natural and harmless way. Fruits such as apples, strawberries and kiwis contain Vitamin C. This vitamin  is considered the element that holds cells together. If this vitamin is neglected, gum cells can break down, making gums tender and susceptible to disease.